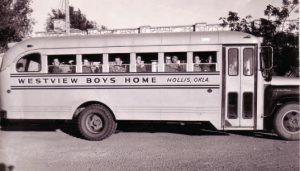 Westview Boys’ Home began in 1956 when a group of caring, Christians sought to provide a refuge for needy boys. When the old Westview school system closed in western Harmon County, the Westview board of directors purchased the original 13-acre campus to begin the Home. Using the old Westview school site, boys slept dormitory-style in the old school building and used the gymnasium for recreation. Five years later, structured family-style living was introduced; at the time this was an innovative approach to child care. Over the years, strong leaders have helped the Home to grow, and as our campus grew, it became unique. Caring donors gave other pieces of land to the Home, and large ranch-style homes were built on them so that all of the boys do not live confined to a single campus. Today, the boys reside in six large, brick homes spread over 1,500 acres. Each individual home offers youngsters a comfortable, warm, family-type atmosphere with parent models of the Christian lifestyle. People of outstanding passion and character have come to help boys as staff members of this Home: some of the best of the best receive the Ed Deaver Service Award. There are a number of wonderful volunteers who have partnered with our outstanding staff to serve the young men at Westview; some of the best of these are honored with the Bill and Christene Nichols Volunteer Award. A number of business partners have also worked with us for years in this work; we are able to honor some of these great partners with the Outstanding Partners Award.